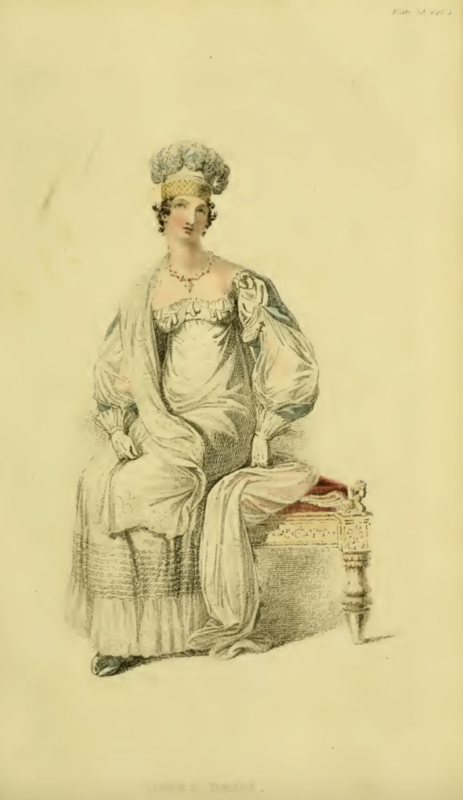 Mrs. Gill of Cork-Street, Burlington Gardens, continues to rule the dress design pages of Ackermann’s Repository for 1816. 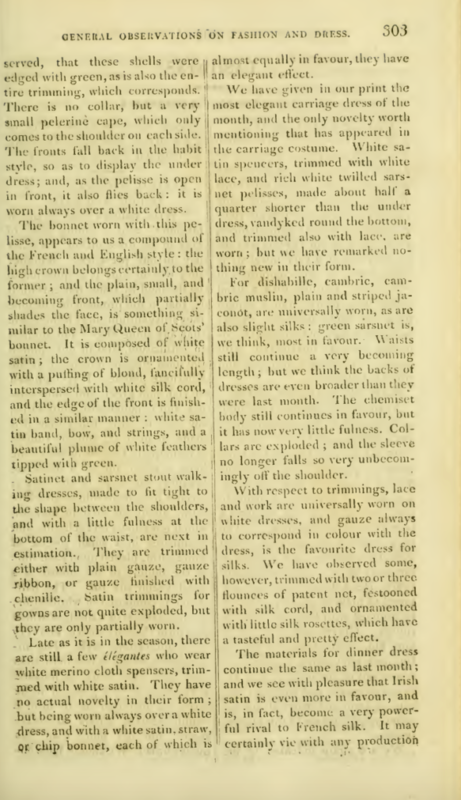 May’s entries, as were April’s, both favor white for their gowns, Plate 28’s evening dress made of satin and lace, Plate 29’s carriage dress of cambric and muslin. 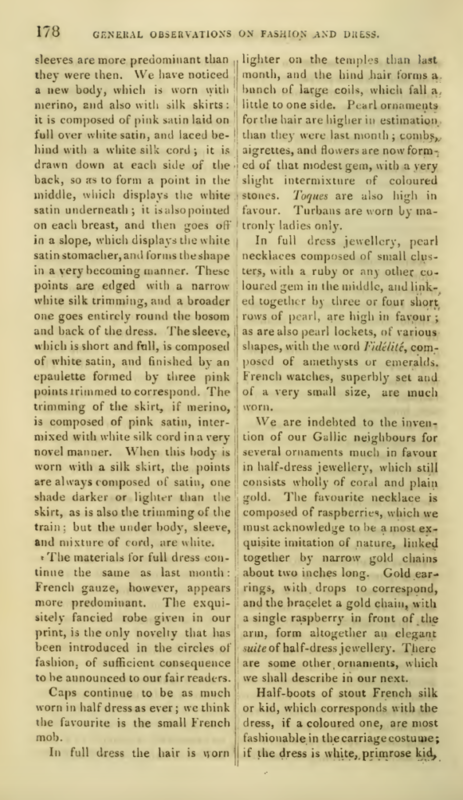 The evening gown’s starkness is lightened by tiny dots of color in the form of “Coloured stones” (“amethysts and emeralds are most in favour,” our correspondent notes below in the “General Observations on Fashion and Dress”). 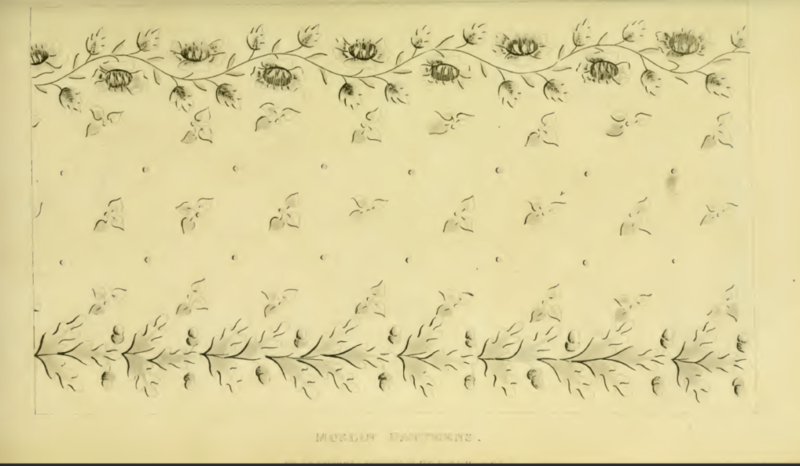 Here they are are used not only in a necklace, but as ornaments on the sleeves and bodice. I don’t recall seeing such stone ornaments in earlier Ackermann’s prints. 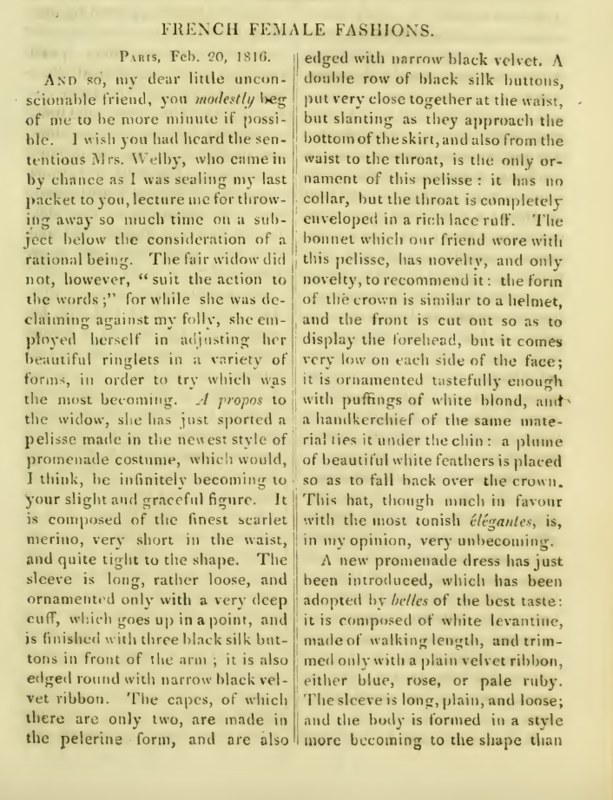 Our correspondent reports that the carriage dress depicted in plate 29 is “the most elegant carriage dress of the months and the only novelty worth mentioning hat that appeared in the carriage costume.” The description of the dress doesn’t really say what’s so novel about it, though. Is it the robe which overlays the dress, made in the chemisette style The blue ribbon bows which ornament the sleeve between elbow and wrist? Or the “elegant ruffle” which edges the end of each sleeve? 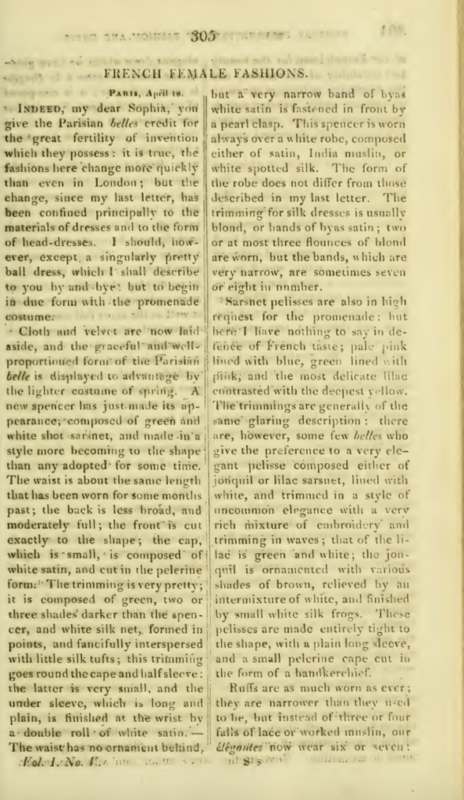 Highlights from “General Observations on Fashion and Dress” include the news that pelisses continue to be “more fashionable than any thing else” in promenade costumes; that green sarsnet is most in favour for casual dress; Irish satin even more in favour for dinner dress; and the robe à la Bergère (shepherdess) is most in favour for full dress. 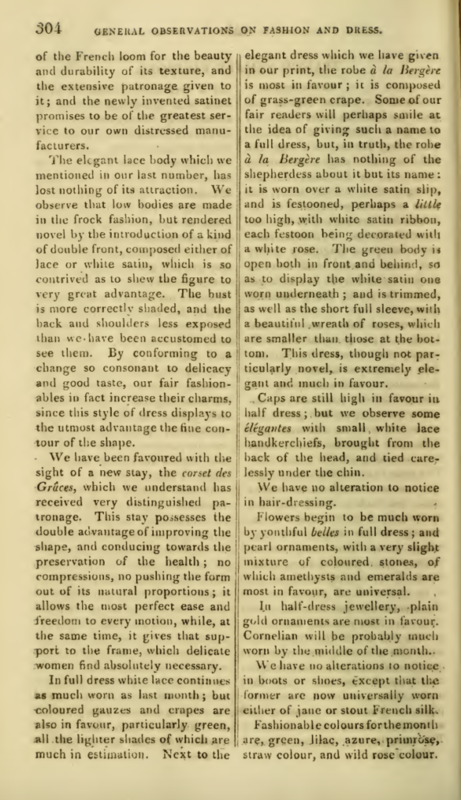 We also hear about the introduction of a new type of stay, the corset des Grâces, which, our correspondent claims, “possesses the double advantage of improving the shape, and conducing towards the preservation of the health; no compressions, no pushing the form out of its natural proportions; it allows the most perfect ease and freedom to every motion, while, at the same time, it gives that support to the frame, which delicate women find absolutely necessary.” I couldn’t find any images online of this particular corset style; anyone have any books on corset history that show what it might have looked like? In London, May’s fashionable colors are reported to be green, lilac, azure, primrose, straw, and wild rose. White is the color of choice in Paris, although there is some request for hyacinth, jonquil, rose-color, lilac, and green. 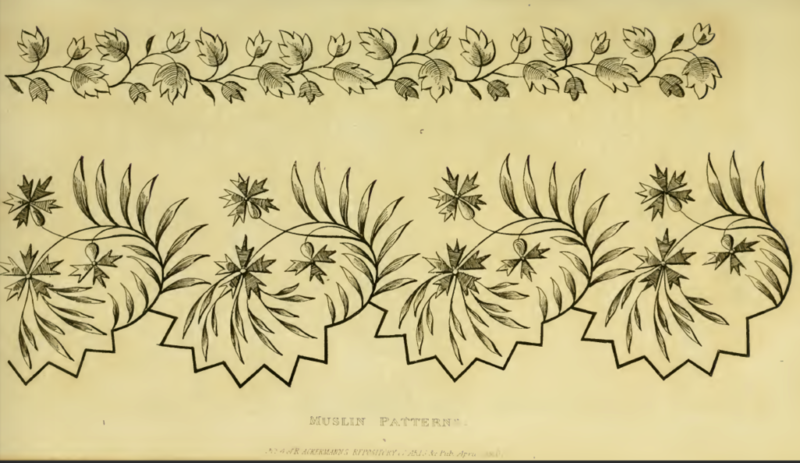 As with March’s fashion plates, April’s dress designs are also by one Mrs. Gill of Cork-street, Burlington Gardens. I’m wondering, now, if these dressmakers had to pay for the right to place their dress designs in front of the eyes of Ackermann’s readers? Or did they just have to have an in with the journal’s fashion writer? As for that writer, I have to say that after reading four months of their commentary, I’m finding their descriptive powers somewhat lacking. 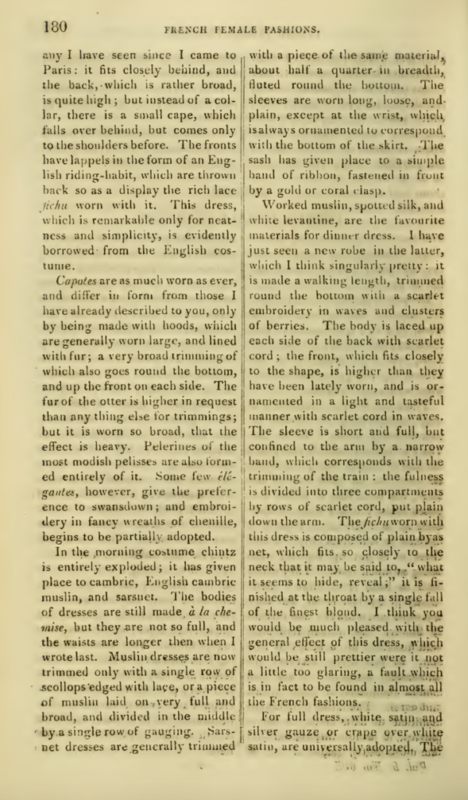 Almost each outfit featured is described with the word “novel”; second in popularity seems to be the word “elegant.” If everything is termed both novel and elegant, how is a reader to know what is truly novel? Or has fashion begun to change so quickly that what was “novel” one month is now displaced by a new “novelty” the next? 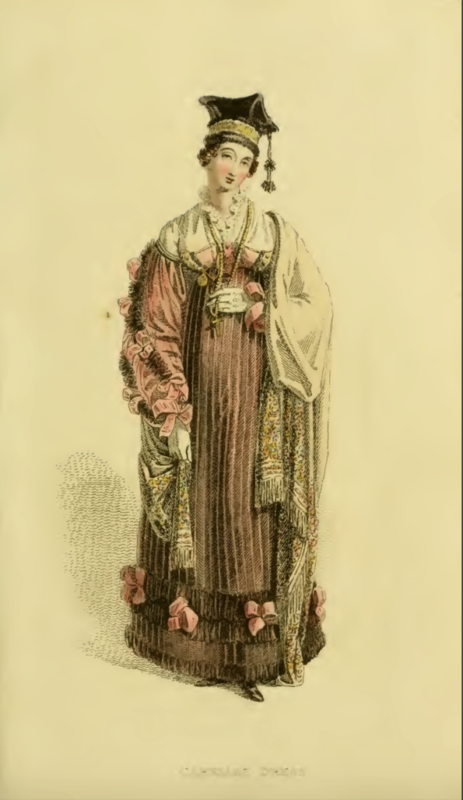 The shape of Plate 22’s Morning Dress doesn’t strike me as particular novel: a round gown of cambric. 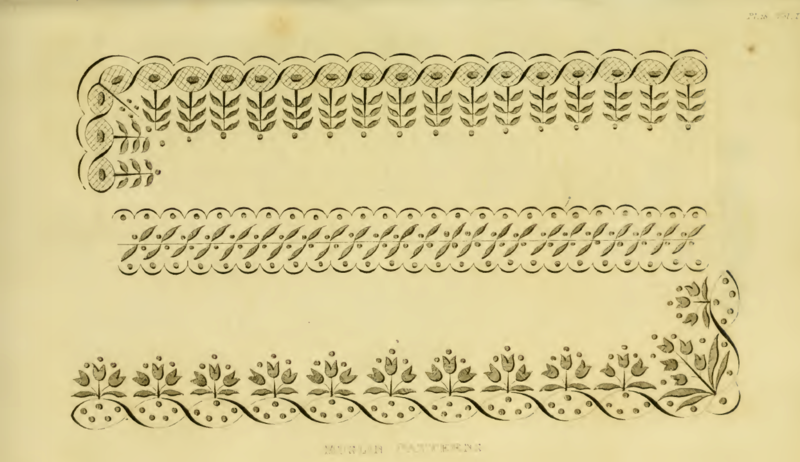 The lines of small tucks, and the worked flounce with a heading seem quite in keeping with the increase of trimmings in post-war fashions. 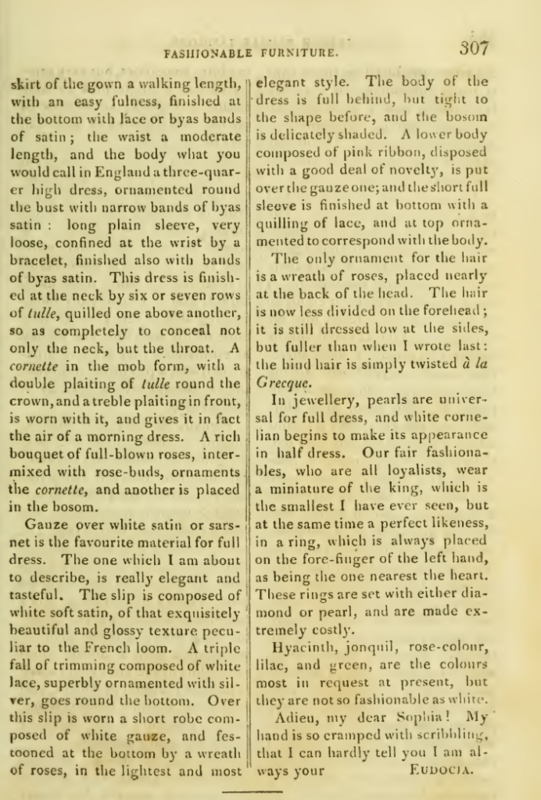 I quite like the bodice, gathered at the center and flowing toward each shoulder. Caps have always left me a bit cold, but our reporter describes this one as “uncommonly becoming,” ornamented with lilac ribbon. 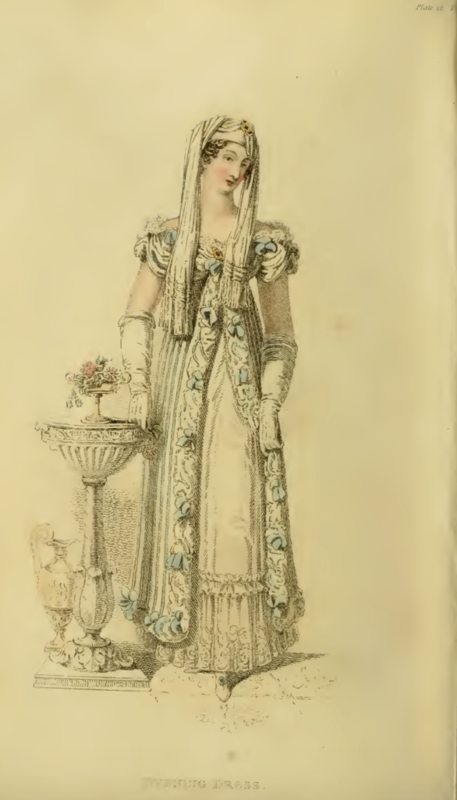 From the waist down, this month’s Opera Dress, plate 23, looks quite similar in style to its companion Morning Dress, although it is made from white satin with a lace overlay rather than from cambric. 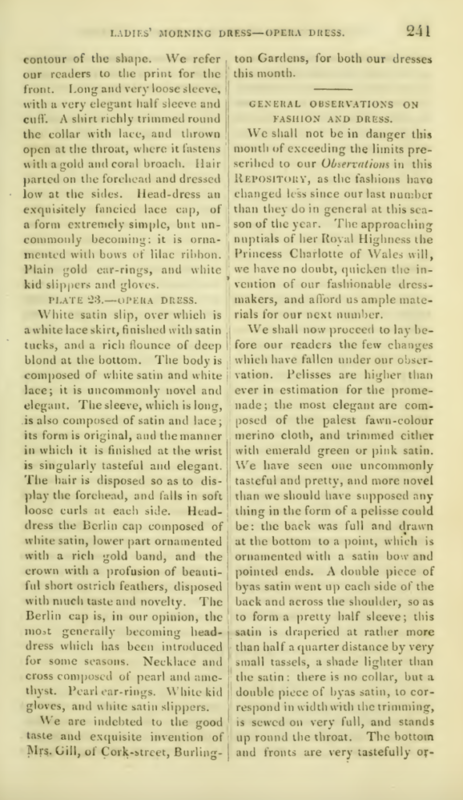 Again, the bodice is not really described in much detail; the columnist seems most interested in the outfit’s “Berlin cap,” with its rich gold band and its crown of short ostrich feathers. “The Berlin cap is, in our opinion, the most generally becoming headdress which has been introduced for some seasons,” writes our columnist. 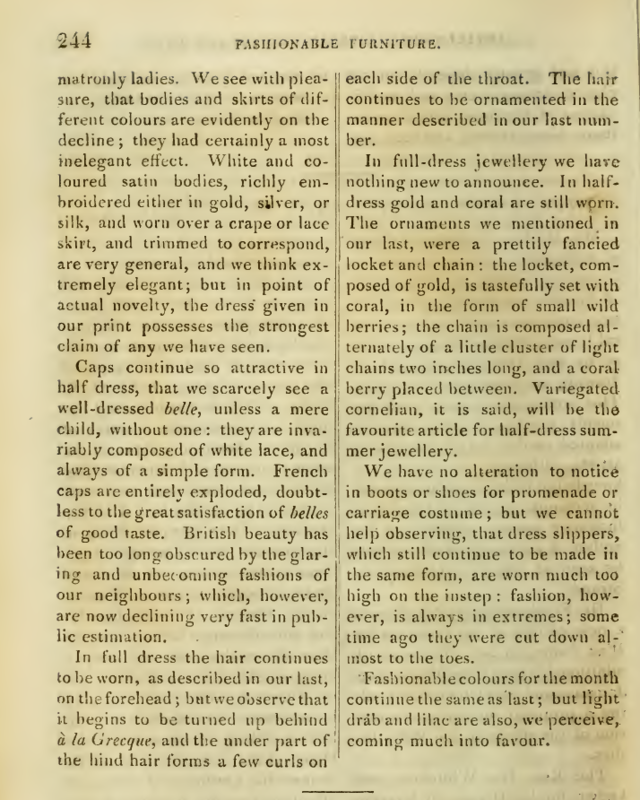 This month’s general observations note that “the fashions have changed less since our last number than they do in general at this season of the year.” But this is likely to change soon, given the upcoming nuptials of Princess Charlotte (May 2, 1816). Despite the report of the increasing fashionableness of mantles last month, pelisses still seem to be ruling the fashion scene. Our columnist’s prediction that the Cobourg hat would increase in popularity seems to have been more on the mark. 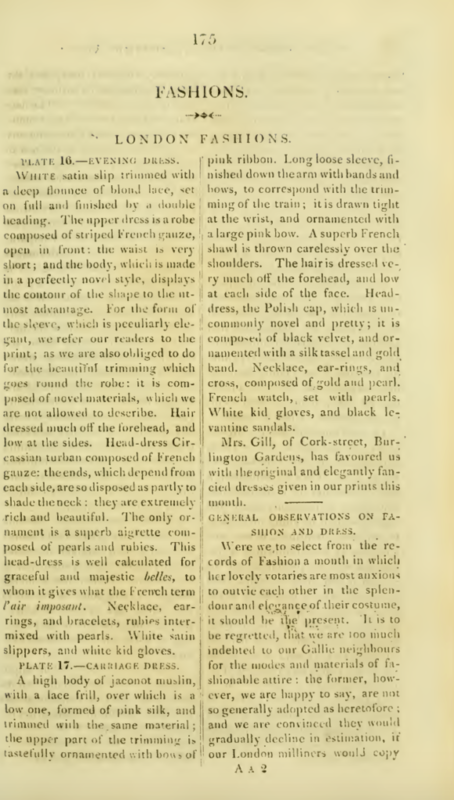 “Satinet,” a fabric composed of silk and worsted, with a rich satin stripe, has recently been introduced, and is reported to be “in much request with belles of rank and taste.” Another recent introduction, Irish satin, is also reported to be popular, especially among those “ladies of rank who wish to encourage the productions of our own looms, in preference to French goods.” (“Satinet” is indeed listed as a fabric in Fairchild’s Dictionary of Textiles, although “irish satin” is not). 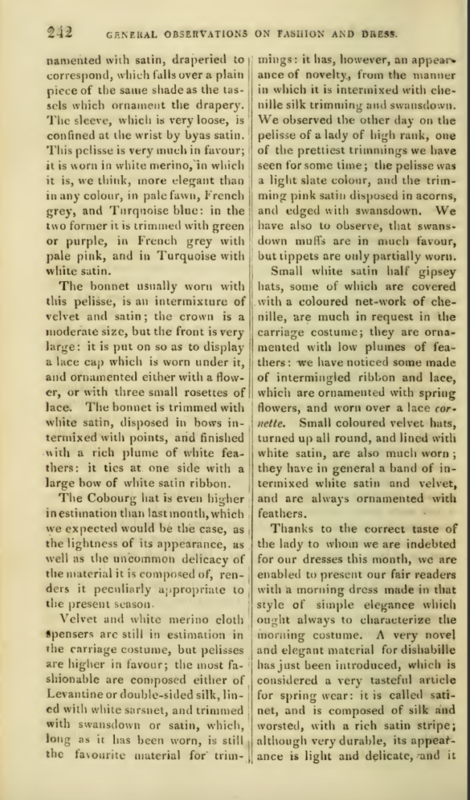 This month’s fashionable colors are the same as last’s, with the addition of light drab and lilac. 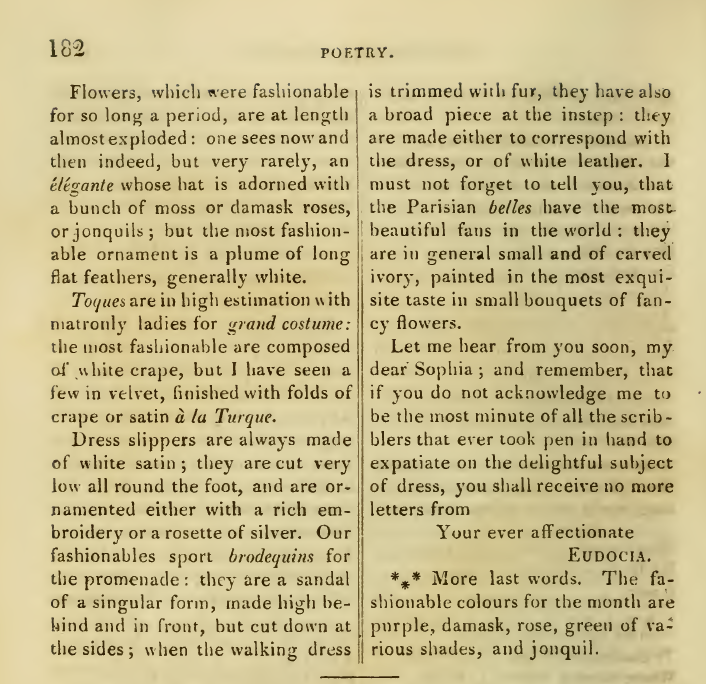 March 1816’s fashion plates feature some quite unusual headdresses and trimmings. 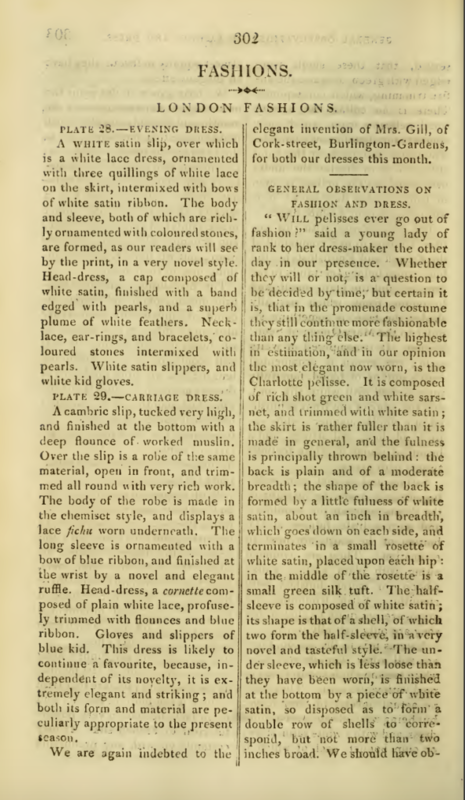 In fact, the sleeves and the trim around the upper robe of Plate 16’s Evening Dress are “composed of novel materials, which we are not allowed to describe”!! 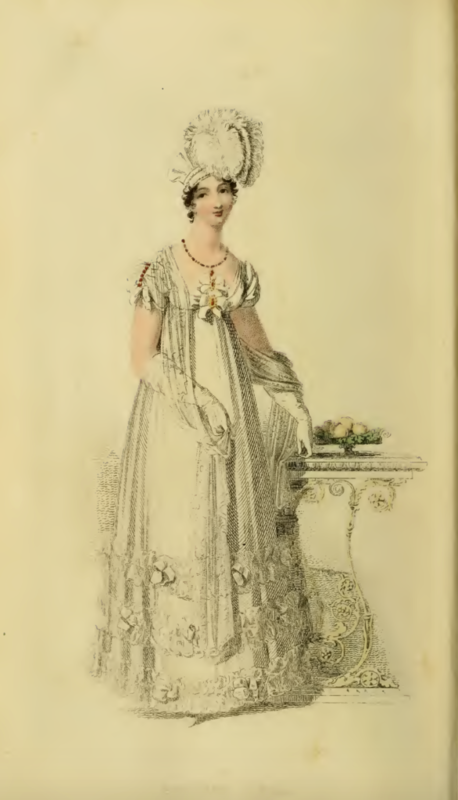 Regency novels often feature scenes of young ladies poring over fashion plates to choose styles for their own new gowns, but such reticence in description suggests that the plates were as much about directing viewers to the gown’s creators (in the case of March’s plates, one Mrs. Gill, of Cork-street, Burlington Gardens) as they were to inspiring viewers to copy them. The model for this month’s Evening Gown stands beside a classically-designed pedestal, which seems quite suitable, as the gown in some ways resembles an over-decorated column. The white satin underskirt is trimmed with a deep flounce of blond lace; the French gauze overdress features elaborately twisted white trim, interspersed with blue knots or florets. The headdress also mimics the look of a classical column: a Circassian turban, with long ends hanging from each side over the ears and down below the bustline. It’s topped with an aigrette (a new word for me! ), a head ornament made either of the feathers of an egret, or a spray of gems resembling the same. I don’t spy any feathers atop this model; the copy says this aigrette is composed of rubies intermixed with pearls. 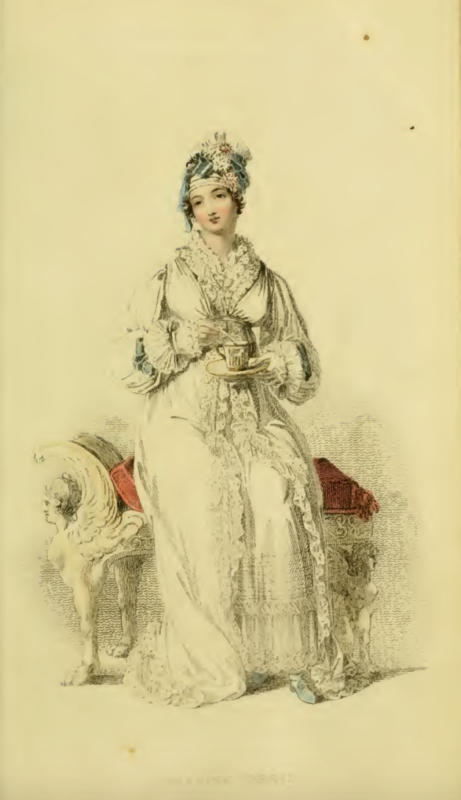 Mrs. Gill’s Carriage Dress, plate 17, also puts me in mind of classicism, although this time classicism at one remove: the classicism of the university. Doesn’t that Polish cap, with its silk tassel and square shape, put you in mind of a graduate student proceeding down the aisle to claim a diploma? “Uncommonly novel and pretty,” the copy describes it. The dress that accompanies it is almost as unusual, with its pink striped silk overdress and bodice which looks more like a contemporary balconette bra than anything I’ve seen before in a Regency-era dress. 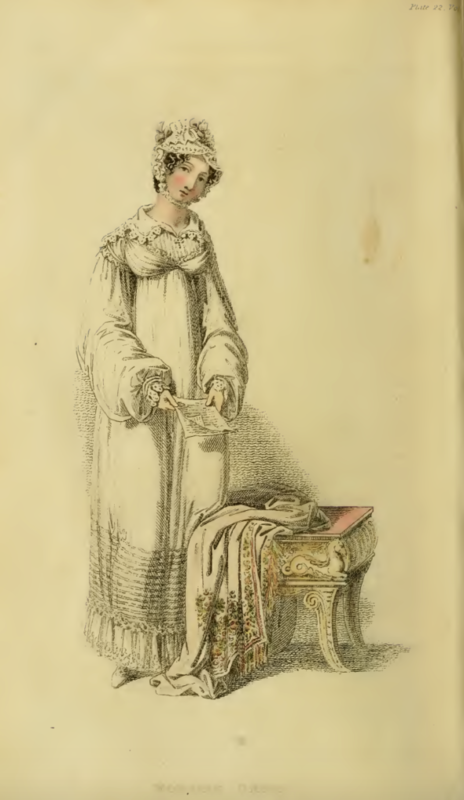 A high body of jaconet muslin covers the rest of the lady’s front. The copy doesn’t say what the brown fringe on the dress’s hem and running down the sleeves is made from; it looks almost like a fuzzy caterpillar, running down her arm, doesn’t it? I’m guessing this is an outfit designed for an open, rather than a closed, carriage—with so much trim, you’d definitely be aiming to be seen! 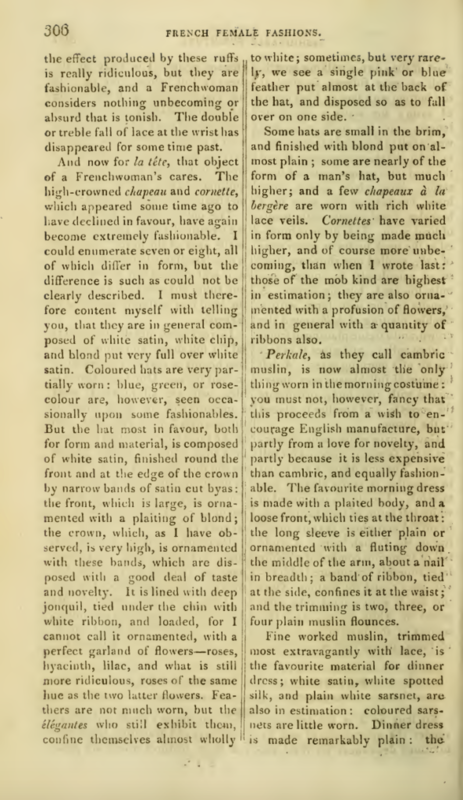 This month’s “General Observations on Fashion and Dress” runs to fashion news runs nearly four pages long, and is followed by almost as many pages reporting on “French Female Fashions.” Somewhat ironic, given the copy of the “General Observations” chides that “we are too much indebted to our Gallic neighbors for the modes and materials of fashionable attire.” In England, “pelisses continue very much in favour,” although mantles are, “though slowly, gaining ground.” Wellington mantles, “just introduced,” the “barouche wrap,” and the “Richmond spencer” are popular, as is the Cobourg hat. 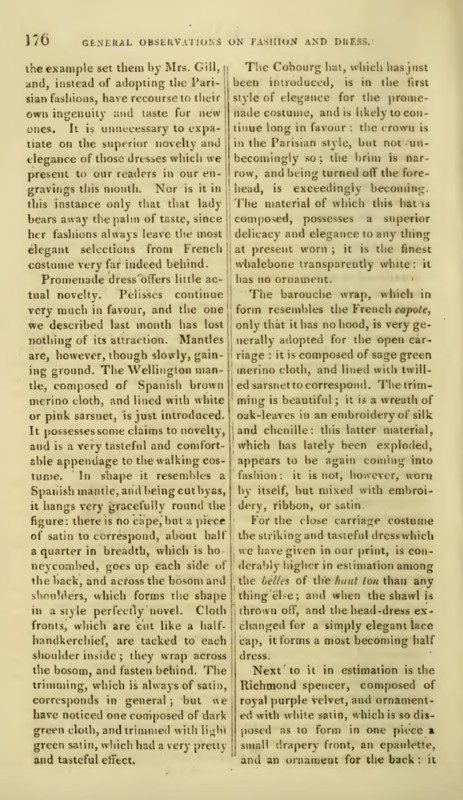 In fabrics, French striped silk (for morning dress) and French spotted silks (for evening dress) are increasingly in vogue. 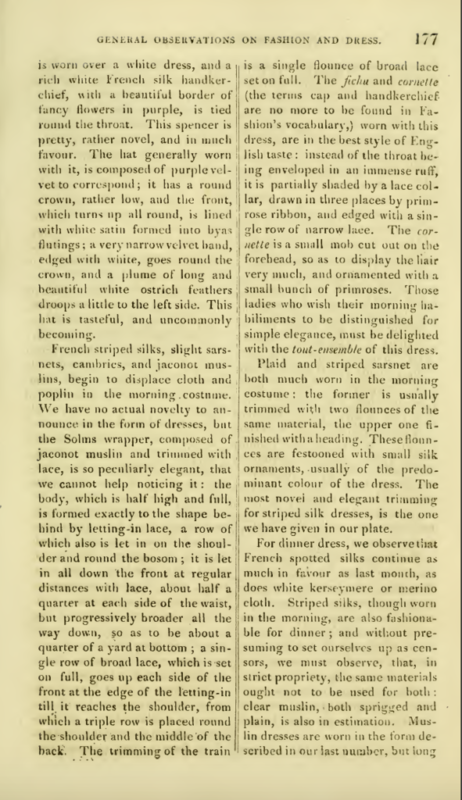 In France, chintz is “entirely exploded”; cambric, muslin, and sarsnet have taken its place for elegant morning dress. Both writers talk of fashions shifting far more quickly than I had imagined—changes taking place over a month, or a few weeks ago. 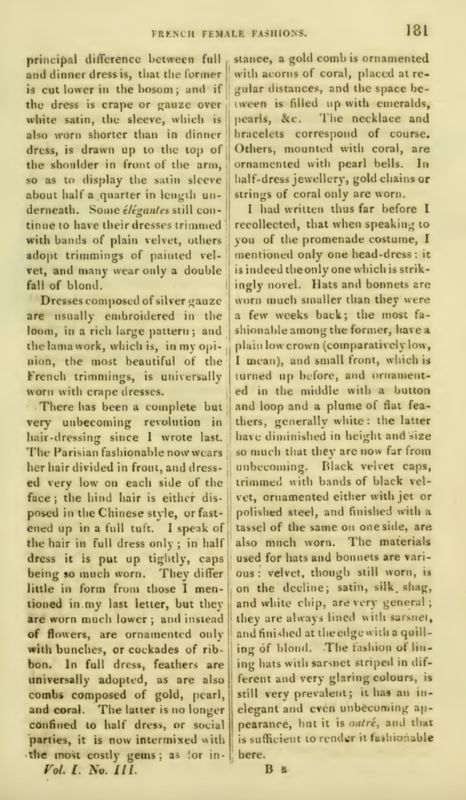 By the time you have a printed copy of Ackermann’s in hand, the styles it details might well be out of fashion! 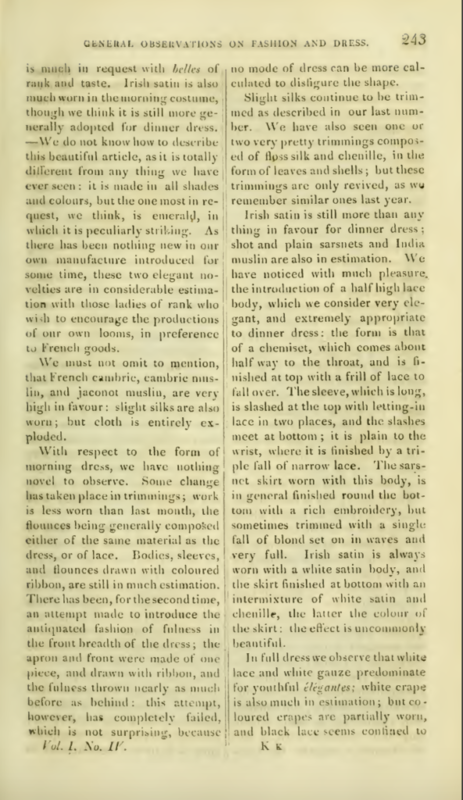 The fashionable colors in France this month are purple, damask, rose, green of various shades, and jonquil. Lots more details in each column; I leave you to peruse at your leisure!